Who inspires you? Who do you actively listen to? Malcom Gladwell author of The Tipping Point, David and Goliath, and Outlier inspires me. In order to be a good owner, you need to participate in what you are offering. Keeping in line with your mission. 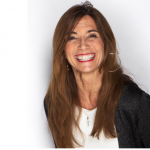 As a brand or a yoga teacher you have to built trust with the clients or students over time. Every Monday morning we read from The Tao of Leadership. A leader creates an awesome product with process. A good leader knows what is happening in every department, he/she knows all the processes that come together to create a better product. Teachers are leaders as well on the podium following a process. Take a listen and hear what I mean! 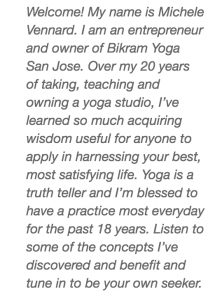 Meet Bomitra Yoga Mountain View​ owner Cynthia Wehr​. Michele Vennard​ and Cynthia have been best friends since they met and help each other thrive and grow. Is there something in your life you are not quit dealing with? Are you taking the outside route rather than actually looking at the problem? Be honest. Bill Gates said in the next 10-20 years the amount of information coming at you individually is going to be overwhelming, and the biggest challenge that we’ll have is how to sort through that information. Being in class is your time to really be present with yourself.